I recently worked with a friend to help her put together a visual health history. That’s what I do as part of the company I’ve started, Pictal Health, and she was the 21st person I’ve worked with thus far. Bonnie came to me with a request. After about 30 years of ongoing health issues, some of which were mystifying and for which she felt she had no answers, she was in the process of gathering her medical records (both from traditional medical systems and alternative practitioners) into one place. She asked me to help her make sense of this vast amount of information so that she could start preparing for yet another upcoming new doctor visit. Let’s take a look at what we did and the many things we learned. I asked Bonnie to take a brief pass through this Google Doc template to gather the highlights of her health history. She was only able to get through the first page, which was still helpful; I decided we would talk through the rest of it together on a call. We then scheduled a video call to go through her health history, and there was a lot to talk through. We reviewed information she’d collected in a personal health record along with scanned-in files from various holistic providers. She also referenced information from the ‘drawer’ where she has put many print-outs of her health information for many years. As we talked, I asked questions with an underlying goal of establishing the timeline of what had happened. We went through the medical stuff, and also the ‘life’ stuff — like an old injury that caused her to change professions, the birth of her children, times when she remembered her symptoms flaring, etc. I then created a timeline for Bonnie based on everything we discussed. I started with the general format I’ve been using with patients; here is an excerpt. We also thought it would be helpful to create a symptom map that Bonnie could share at an upcoming doctor appointment. This view is a compliment to the timeline; it shows ‘on the body’ where she feels different sensations and has been a helpful reference in doctor appointments for other patients. It can take a lot of emotional energy to face your health history. With Bonnie, as with others I’ve worked with, two moments in this process were especially difficult. One was figuring how how to get started with telling her complicated story. Facing the big pile of records was intimidating. It was hard for her to sit down and start writing out her story, even within the structured template that I provided. Bonnie told me that my flexibility and supportive emails helped her feel less intimidated about this process. The other difficult moment was receiving her timeline and looking at everything all together. It can be sad and overwhelming to see how much you’ve struggled over many years. 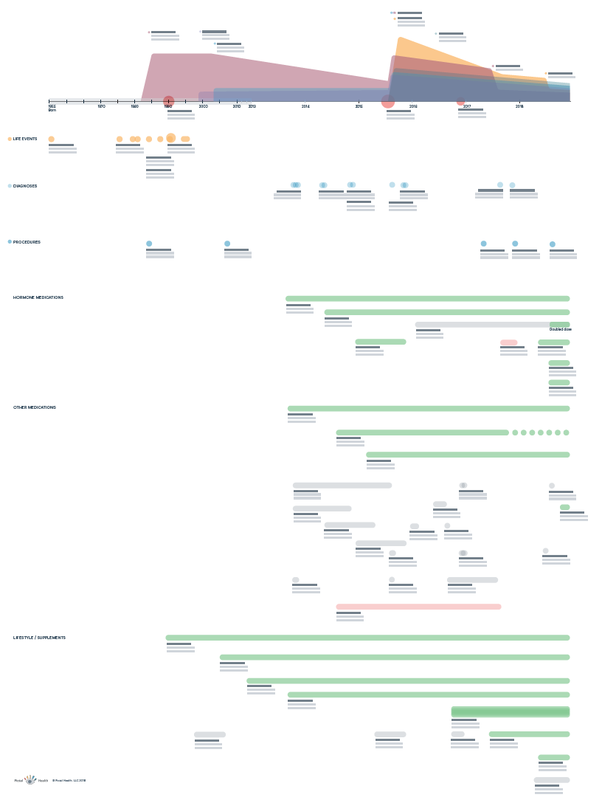 The shape of the timeline shows desperation, successes, and failures. As Bonnie said, “It forced me to study my own health history — that’s challenging.” I’m still trying to figure out how to make this process easier for people. When we talk about visualizing information, we often use the word ‘insight’ — the hope is that, by seeing information visually, we’ll be able to come to new conclusions and learn new things. And that is often the case. But sometimes visualizing information results in more of a solidification of knowledge— a validation of our intuition. For years Bonnie had sought answers for why she had experienced crippling fatigue and other symptoms after a bout of shingles. Her doctors had repeatedly insisted that there was no connection between shingles and fatigue. 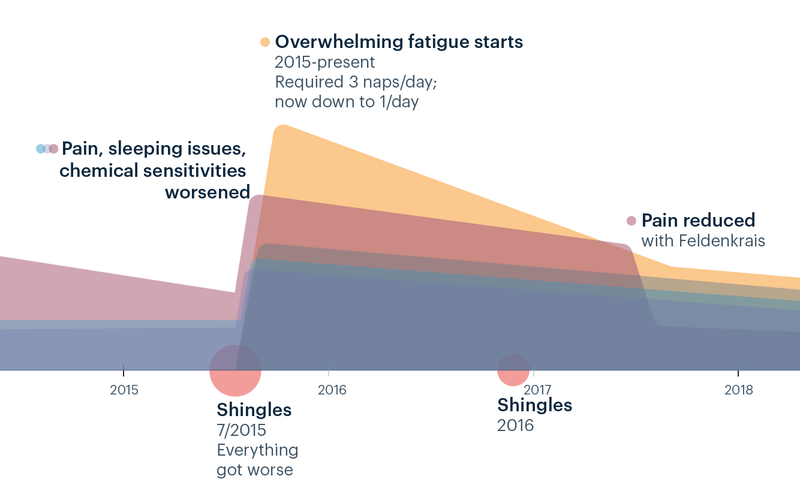 But seeing her timeline helped solidify the connection for her; it’s clear from the image below that after her 2015 bout of shingles (the larger red bubble), all of her previous symptoms flared up and new profound fatigue (yellow) started. Seeing this, Bonnie decided to search again, and after some online sleuthing she found documentation of the shingles-chronic fatigue link. It wasn’t necessarily a brand new insight, because she’d had suspicions in the past, but it validated her prior theory and also gave her a sense of peace. She finally understood a little bit better why this had happened to her. Bonnie had one of the largest quantities of medications of anyone I’ve worked with so far. And she’s struggled with her health for far longer than she has accurate records, so there is likely a whole slew of treatments missing from her list. 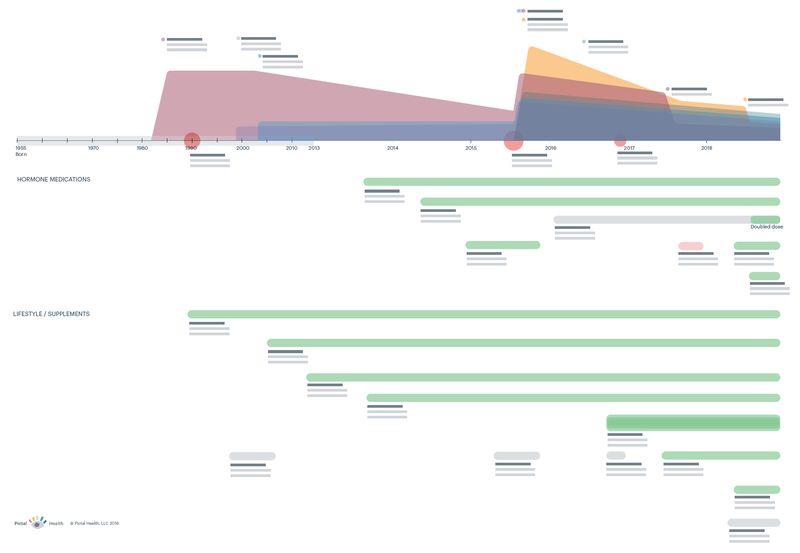 The sheer number of medications actually makes her timeline difficult to parse or print; the medications stack up vertically (in the current design, anyway), which places more emphasis on them than on other elements of the canvas. On a computer, you have to zoom out so far to see the whole thing that the text is no longer legible. I’ve blanked out the words on this screenshot below, but you can see what I mean — it’s a lot! It’s overwhelming, and the shape of her story shows us how Bonnie has struggled to find effective treatments for her myriad health issues over time. With Bonnie, I experienced just how much refinement, grooming, and personal storytelling was necessary to make sense of — and create a story from — her large amount of medical data. This helped me really internalize that you can’t simply aggregate health data and expect to create a patient’s whole story; I was inspired to write a whole post on this topic, which you can check out here. As you may have noticed, I also colored the medications based on whether they helped (green), made things worse(red), or had uncertain efficacy (grey). This was a new format that I had not tried before. 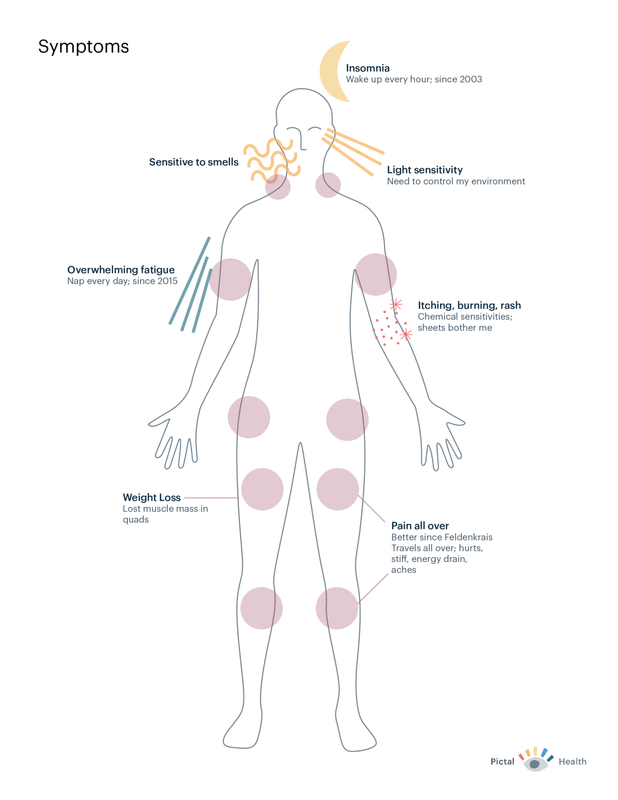 While it adds some visual noise, Bonnie suggested doing this so that she could more easily discern the helpful treatments as she presented her story to her doctors, and I think it is a helpful design update. Whenever I have the chance to work with patients who have multiple chronic health issues, I learn something new. Not only about the convoluted nature of our health system, but important things like how to support people emotionally through reviewing their health history, and how the Pictal Health designs can better accommodate their stories. Thank you to Bonnie for letting me dive into her story and for sharing her own impressions of this process on her blog.